Vintage number 14 for Heathcote II and the first season where Peder have not had to complain about the weather. It has been just perfect through and through. What a contrast to last vintage, after the 2015 warmest spring, the 2016 spring was cold, delaying flowering quite a bit, the summer was relatively mild with a late spurt of heat and with regular rainfall throughout the season. The result is probably over 100h of mowing and a vineyard like we dream it looking like a garden. The biggest crop we have ever had, still a tiny 20 ton but large for us! and every vessel occupied and a lot of juggling during fermentation to make everything fit. Quality looks great and Peder has made a few unique wines for the 2017 vintage. With this Grenache Shiraz blend we set out to take advantage of the great vintage 2017 fruit to make an easier drinking wine with shorter oak aging, Cotes du Rhone Style. While we expected the delicate elegance of the wine, the concentration actually surprised us and this wine has evolved into a more typical Heathcote II which will keep very well. The colour is a vibrant purple, the notes are sour cherries but with a sweet undertone, almost caramel. As it opens in the glass, the wine turns more savoury with darker fruit on the nose and spices in the palate. The Tempranillo 2016 continues in a classic Spanish style of previous vintages, presenting a medium dark colour with aromas of spice and vanilla interlaced with dark fruits – cherries, mulberries, blackberries. The oak is subtle and tannins are quite soft yet the wine will benefit from being opened early. After a while in the glass, the texture becomes richer with a long finish. Very limited quantities available. 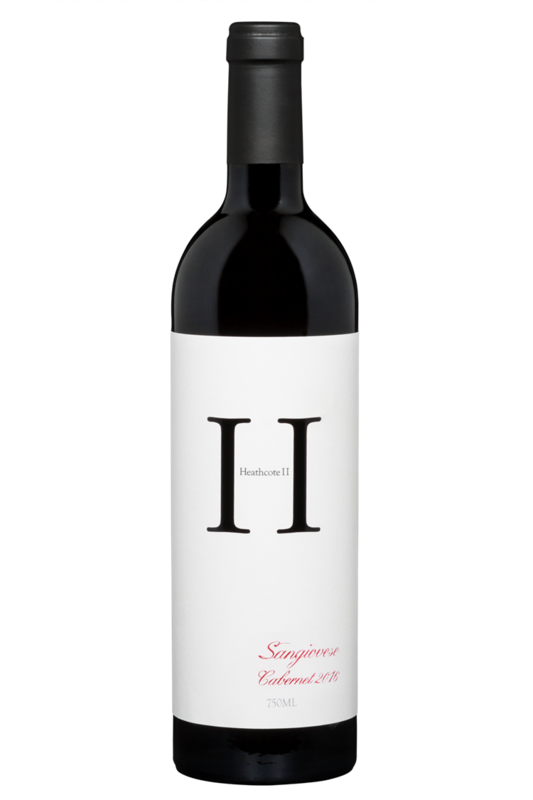 Made with one row of Sangiovese vines from our neighbouring “Dead Horse Hill” Vineyard , this blend is made in a Super Tuscan style with 30% of cabernet sauvignon (from our Heathcote II block) balancing the structure of the Sangiovese and making this wine a true Heathcote II wine with our classic concentration of flavours and texture. The wine presents a nice tannin structure with cherry, mulberry and spice and some vanilla. How did the Vines do it ? An amazing year in many aspects. The spring was very warm with record temperatures in October helping the vines grow a great canopy that proved critical for the hot months that were to come. We finished the organic compost application started in 2015 on the complete vineyard which looked great even throughout the hot summer. Rain was very scarce during the late spring and summer and vintage came in early, all done in early March. Yet great quality and much higher quantities compared to 2014 and 2015, our 2 small vintages. The high ratio of leaf to fruit evident in the very even ripening and the fruit was just beautiful. Possibly our best Tempranillo yet ! The 2015 Tempranillo was bottled in February 2017 and it’s the first time the Tempranillo has been aged for 23 months in oak. Two barrels were made, one three years old and a five year old French oak. With its deep ruby colour there is something earthy and spicy to this Tempranillo. With time the plums and cherries develop into darker fruits, and chewy tannins. This is a full bodied wine with a good level of glycerol which adds to the texture. After a while in the glass the fruit gets sweeter. It is still young and with its balanced acidity it will age well. The 2015 Grenache was bottled in August 2016 after 17 months in a five year old 300 l barrel (French Oak). The colour is pale ruby which is typical of the variety. First impressions are raspberries, cherries and strawberries, followed by some savoury notes. There is a lovely spicy flavour to this Grenache, with a sweet juicy finish. The wine has a medium bodied texture and the tannins are round and smooth. Despite some fairly good canopy growth, the harvest was quite light in 2015r and only marginally ahead of 2014. The season came in very early and very compact with pretty much everything ready at the same time. Good rains in early January and high leaf to berry ratios ensured a very even ripening and overall excellent fruit quality. The rest of the summer and fall continued to be very dry which was perfect for ripening. Early in the season we applied organic compost to half of the vineyard and that did help the vines cope with the dry summer very well. In 2015, the Grenache block did really well 6 years after planting and that reflected well in the crop. The first long awaited vintage of our Bush vines. 5 years since we planted them and 5 years of back stretching care as their roots find their way through the rocks at the top of of our property. Bold with Elegance, this fourth vintage of our sough after tempranillo does not disappoint. 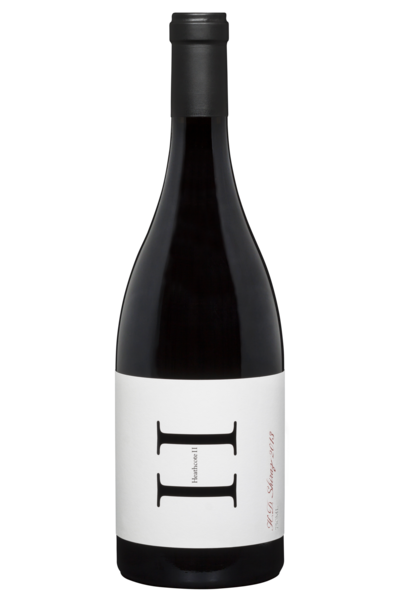 Peder continues to develop his Spanish style of Tempranillo with great concentration and fruit for a wine approachable young but yet one which will also be at home in the cellar for a few years. 2014 marks the return of warmer conditions to Heathcote with also a much drier growing season. Very hot summer temperatures not unlike the 2009 vintage to which we responded with fairly aggressive fruit thinning. The resulting wines are back to a slightly bigger style, with great concentration and texture. Very deep color and great aging potential. The harvest was in the end of great quality but very small quantities overall as we worked to control stress in the vineyard through lower yields. 2014 is the first vintage for our Grenache block to have a real crop and finally getting the fruit of 5 years of back stretching care for the young bushvines grown in rocks at the top of our property. First impressions are blueberries, eucalypt, pine needles. The oak is not obvious now but it will become more apparent with time. Rounded smooth tannins. I tasted the same bottle the day after, and the Shiraz had developed a more charred wood character, together with spice and black cherries. On the first day of tasting, the HD Shiraz is very closed, dry and just a hint of the 75% new oak comes through. The day after, blueberries and charred wood. There is a mineral aspect to it and it has very good acidity. The tannin structure is dry but fine. Still extremely young and needs time in the cellar. Initially a bit closed on the nose. The structure is tight and so are the tannins. As the wine opens up there is a good fruity concentration with cherries and rich ripe plums. Dry finish. This is a wine that needs a couple of years in the cellar. There is plums, cherries, some oak and a spicy­­/savory note to the Tempranillo. This is a full bodied wine with big flavours. After a while in the glass the fruit gets sweeter, like Strawberries. There is lots of spices too. A long dry finish with pleasant tannins. The 2013 showcases what the Heathcote region is known for: power on an elegant frame. With decent spring rain and vine growth, the fruit looked very healthy and the vines carried one of our larger crop of the last few years. With a fairly long ripening with clear days and cool nights, we brought in the crop over a quite long period adding complexity to the wines. As always Tempranillo was first off followed by Shiraz and finishing with Cabernet Sauvignon. The winery was absolutely packed up during fermentation! Dark purple colour. Lots of spices on the nose (cloves, cardamom, pepper), black berries. Very spicy on the palate as well. Sour cherries, red currants, blackberries and hints of oak. Good tannin structure and a long refreshing finish. An explosion of spices and oaky aromas up front. Then charred wood and vanilla. Spice and oak notes on the palate too along with cherries and blueberries. Very nice texture and soft tannins. Very long finish. Deep dark colour, dark purple edge. Cassis, blueberries, and pepper are the first impressions. Later some vanilla, liquorice and a hint of mint. Light and pleasant tannins. Well balanced and a good level of acidity. Dark colour. Concentrated fruit on the nose, blueberries, mulberries and vanilla from the oak. The palate is pretty concentrated too with lots of sweet dark berries, chocolate and vanilla. Good amount of tannin and a long dry finish. Again a very dark colour. Cassis and spice on the nose. Good fruit concentration on the palate; cassis, blackberries, good sweetness from the fruit. The oak is there, but hidden behind the fruit. Tannins are nice and chewy. After a difficult year in 2011, we attacked 2012 with a bias for action in the vineyards. As the season developed, we worked to keep the canopy opened, trimmed the long canes, keep the air flowing so we could manage the more humid conditions with minimal disease pressure. This paid off and as the season dried up and summer heated up, we had a fantastic looking vineyard and a great crop building up. The ripening was very early this year and we came to flavour maturity with all the varieties much earlier than in prior years. The quality of the fruit was really nice and selecting HD Shiraz was hard, all the fruit looked so good ! A nice change from 2011 when we had to forgo making HD Shiraz altogether. The colour is a bit lighter than usual with a dark core. First impression is strawberry, liquorice and dried Provence herbs. There is also a very floral note of rose petals. The taste is very savoury with tar and spice. Red sweet summer berries appears on the after taste. This Shiraz has a great texture, good mouth feel and a dry finish with a good level of tannins. The Merlot has a great colour – darker than the Shiraz. Up front on the nose there is black cherries, sweet plums, spice and oak. With a bit of air, tobacco and marzipan are some of the more complex aromas that develop. Sweet red fruity flavours are in the background, but this Merlot is a bit closed now. Dry after taste, a good acidity and fine tannins. This wine was fermented in a new French oak puncheon and aged in 50 % new French oak. The Cabernet Sauvignon 2011 possesses a deep dark colour. Black currants, spice and oak are the first aromas you notice. This wine is very complex. Other aromas are mint, tobacco and vanilla. The after taste is dry and long. The tannins are a bit dry and firm at the moment, so give this one some time in the cellar. This limited release Cabernet Sauvignon has great potential. The colour is dark red. Black berries and black cherries dominate the nose. The Myola is very complex, with spice, tobacco and cool mint. Again there is great texture. The flavour is full of dark fruit and spice, and there is a hint of sweet fruit on the after taste. The finish is dry and with some firm tannins. The Myola is quite closed now and it needs some time to develop. The Cabernet Franc component of this wine was fermented in a new French oak puncheon. 2011 took us by surprise after so many years of drought, with rain throughout the growing season and relatively cool temperatures. And while rain was more intermittent in the summer, it came in regular big showers. Early on, it was clear that the vineyard was enjoying this weather a bit too much with lots of growth and a very high fruit set. So we went in and cut green growth to reduce disease pressure and removed any damaged fruit. When the time came to harvest the Shiraz, we ended up with field sorting, bunch by bunch, and left about half of the crop on the vineyard floor. While in the same block, the Cabernet and Merlot varietals must have thought they had been transported to Bordeaux and gave us gorgeous fruit and plenty of it. We decided to make our Shiraz from the fruit we had sorted and gave up on the HD Shiraz. So overall a very un-usual vintage for Heathcote II, with little Shiraz made and a lighter wine that has more in common with Southern Rhone than with our other vintages. A great Cabernet and Merlot year that allowed us to make a barrel of single Merlot and single Cabernet Sauvignon in addition to our usual Myola blend. The colour is medium dark with a purple edge. The wine has a spicy nose of white pepper and after a while in the glass some sweet fruity aromas and oak start to show. The flavour is bursting with concentrated red fruits. This Shiraz has a good level of glycerol which gives the wine a great mouth feel and great length. The tannins are still a bit dry yet there is some nice sweet vanilla on the finish. The HD Shiraz has a deep dark colour. The nose is concentrated with blackberries with some very mineral and spice notes, supported by some sweet fruit in the background. The wine has a great texture and on the taste you find the spice again, followed by dark fruit, nice fine tannins and a dry finish. It is a bit closed now so it will be interesting to see how it develops. Again medium dark in colour, with a purple edge. Mulberries and perfumed violets dominate the nose, followed by some smoky oak characters. The taste shows good acidity with great sweet ripe red fruits layered on mineral undertones. The Myola has a very good level of texture, with dry tannins on the finish. In 2010 the Myola is a blend of 41% Cabernet Franc, 32% Merlot, and 27% Cabernet Sauvignon. 2010 was the drought breaker year with good spring rains and long ripening season. For the first time since we arrived in Toolleen, the good winter rains continued into good spring rains!! The vineyard responded well with excellent cane growth and the vines developed a nice thick canopy. Then the cool summer came and we enjoyed one of our longest ripening seasons. A hail storm in early March almost spoiled the whole party, but the canopy and the bird nets saved the day and damage was minor though noticeable especially on Cabernet Sauvignon. We then had a few scary showers right through harvest. But no complaints, overall a good long season with great fruit. This translates into wines that show great balance with cooler characters and lower alcohols than previous vintages while maintaining the concentration we like. Probably a vintage closer to Rhône characters this year; a bit of a holy grail we must admit. “Full bodied and concentrated” Click here to view. “There is a really good balance of structure and flesh in the mouth,” Click here to view. “An intensely scented nose of creme de cassis,” Click here to view. The very good balance in the 2009 growing season translates into some of our best wines yet. We have the 2009 Shiraz, HD Shiraz and Myola available and all three wines show great colour and concentration with a very fruity approach, and a great depth of flavour. They are certainly set for a long life but still very accessible now. “Very full bodied and very crisp” Click here to view. The Shiraz has a magenta/purple colour with a solid concentration from the core to the edge. The nose is packed with black cherries, sweet mulberries, some cedar/anis characters and spice. Palate shows a good concentration with a mix of cherries, vanilla and blackberries. The tannins are soft and the acidity gives the wine a fresh finish. “It’s delicious now but has more to give” Click here to view. “Depth and Intensity” Click here to view. Bright purple colour, not opaque, and with a slight lighter purple edge. High viscosity with sweet blueberries up front followed by mint, eucalypt, charred oak, black olives and blackberries on the nose. Again the blueberries dominate the palate with a creamy vanilla taste. At first the tannins are tighter, but once the wine has opened up, it gives way for a long and smooth finish. “Highly perfumed bouquet” Click here to view. The colour is ruby crimson, with a slightly more developed tone on the edge. The nose is fruity and is showing sweet ripe plums and red currants. After a while a more minty character develops, and there are spices as well, like pepper, nutmeg and quince paste. The finish is quite dry with a good level of tannin and acid that should give the wine a long life. Alcohol: 15.0% w/v – pH: 3.57 – Acidity: 6.4 g/L – Residual Sugars: 0.60 g/ L.
The Myola 2008 is made of 36% Merlot, 34% Cabernet Franc and 30% Cabernet Sauvignon. After the difficult 2007, no doubt the 2008 was a relief. Though continuing the dry trend of the previous years, the spring was slightly wetter, avoiding any frost issue. Good rains in November and December ensured good canopy growth and fruit set. The summer avoided any extreme heat until… harvest. So it all looked fantastic until a 2 week heatwave in early March compressed the vintage over a very small window. Acid levels dropped quickly as night temperatures remained elevated and we decided the lift the fruit quickly to preserve the quality. With the whole region working to quickly harvest the fruit, labor became difficult to get and Peder and I ended up picking the Cabernet just the 2 of us, an experience neither of us would like to try again! Two years later, tasting the wines, we can see that was the right decision with wines retaining great minerality and elegance. Apart from the stress of the very compressed timeline, in the winery the vintage went well. The acid additions were minimal except for the last batch of Shiraz harvested which was a bit of a monster and needed to be tamed. The Shiraz went into a mix of new, 1 year and 2 year old oak, while the HD Shiraz continues to be in 100% new oak. The Myola returns to a Shiraz free version with a full barrel of Cabernet Sauvignon aged in new French oak as part of the blend. A great barrel that we hope someday we can release as a single varietal wine! “Zesty minerality and concentrated black and blue fruit flavors” Click here to view. The wine presents with a deep black core and a vibrant purple edge. On the nose, sweet blueberries with a hint of eucalypt are supported by notes of oak in the background. The complex flavours of sweet black fruits unwind on the palate with a definite savoury profile and a strong minerality. This is a great food wine. The concentration of the HD Shiraz is further reinforced by the extremely low yield of the 2007 vintage. The texture is well developed, supporting beautifully the layers of flavours and provides a great finish. The oak is well integrated for such a young wine, though the tannins are still quite firm. On the second day, the wine appears sweeter with a fruitier profile, is more approachable but manages to keep a great complexity. We do recommend laying the HD Shiraz 2007 down for 2 to 3 years minimum. “Captivating…impressively energetic finish” Click here to view. “A very complex bouquet…as does Château Haut Brion” Click here to view. The wine has a dark yet luminous purple colour with long thin legs on the glass. The nose of the 2007 Myola is of red berries, cherries with a hint of blackcurrant supported by very earthy undertones and a bit of oak spice. In the mouth, the wine is quite bold and big with dark fruits, blackberries and plums. The long finish reveals some further oak notes. The tannins are very dry at this stage and the wine further opens in the glass with a hint of mint. On the second day, the tannins have softened and the texture is smoother making the wine more approachable, with the oak quite well integrated. We recommend decanting the wine if it is to be enjoyed young, but better yet laying it down for a few years. The Myola 2007 is made of 30% Merlot, 25% Cabernet Franc, 23% Cabernet Sauvignon and 22% Shiraz. “Impressively concentrated” Click here to view. “Large-scaled on the palate” Click here to view. The dense, impenetrable colour puts us on alert for a great concentration. At this very young age, the smoky oak is quite forward on the nose, opening to a complex bouquet of sweet berry flavours developing into a rich palate of darker flavors including black olives and bitter chocolate. The finish is long with hints of vanilla supported by a full-bodied texture. We further tasted the wine a full day after opening finding the oak better integrated with further development on the texture side, a brief preview of the great potential of this wine. We recommend decanting the wine if it is to be enjoyed young, but better yet laying it down for a couple of years. “I really like the streamlined personality of this wine” Click here to view. “Violets, espresso, scorched earth, blueberry…” Click here to view. As usual, the HD Shiraz is more approachable when young than the regular Shiraz. The approach is fruity with the oak already well integrated. Hints of mulberry, coffee and liquorice come in many layers with an extremely long finish showing some interesting mineral characters. Silky smooth tannins and a great texture support the structure of this amazing wine. On the second day, the complexity has further developed, a testimony to the long ageing potential of this wine. Definitely a crime to drink young, please lay it down for 2 to 5 years. “This could run with plenty of high-end Napa wines” Click here to view. “Sophisticated, intellectual style of wine owing more to Bordeaux than Napa” Click here to view. The deep colour has a beautiful purple hue at this young age. The Myola 2006 is fruity, with blackcurrant notes and undertones of chocolate and tobacco supported by fine oak in the background. The tannins are quite firm at this time and the finish is dry. Will certainly age into a stunning wine. On the second day, the tannins have softened making the wine more approachable. We recommend decanting the wine if it is to be enjoyed young, but better yet laying it down for a couple of years. The Myola 2006 is made of 40% Merlot, 40% Cabernet Franc and 20% Cabernet Sauvignon. A very expressive nose of sweet red fruits combined with spicy oak comes quickly out of the glass while you notice the vibrant dark purple colour. The taste follows with those same red fruit characters supported by a beautiful texture that keeps on giving. The tannins are fine though still young indicating good ageing potential. The finish is long and dry with hints of dark cherries. A deep dark red slightly developped colour is just a preview for the dark red fruit nose with hints of vanilla and mocha. In the taste, the new oak is there in the background while the fruits with notes of blueberries evolve to darker aromas towards a liquorice finish. The tannins are already quite soft. The velvety texture supports a long dry finish. The inky colour promises great concentration. The nose does not disapoint higlighting the complexity of this blend. In 2005 the Myola is made of 50% Merlot, 30% Cabernet Franc and 20% Cabernet Sauvignon. The taste of sweet blackcurrant upfront is followed by more floral notes but the tannins are still quite strong showing the influence of the cabernet sauvignon. Showing great potential with fantastic texture and finish, this wine still needs more bottle time. 2005 started with one of those wonderful springs where everything became so lush and rain was unusually regular. While there was plenty of sunshine in December and January, temperatures remained relatively cool leaving the vines developing with minimal stress. February came on strong though, accelerating ripening and bringing sugar levels up. Harvest then came on quickly in mid March starting with Merlot and Cabernet Franc, with Shiraz harvest spread between March 18th and April 2nd. In 2005 it was a very small harvest of Cabernet Sauvignon and it was all picked on April 2nd. Yields were slightly higher than in 2004 , but still remained well below the 1.5 ton per acre mark (25 hl/ha). Fermentations went well and temperatures stayed well in control. As in previous years, the HD Shiraz was fermented in new Troncais French Oak Vats, and this year with the cabernet sauvignon harvest being sufficiently delayed, we managed to ferment it in those same vats, working to integrate the tannins at an earlier stage while increasing the complexity. The Shiraz was aged in 50% new French oak, while the HD Shiraz continues to be aged in 100% new French oak and the Myola blend in 30% new French oak. All wines were made without fining or filtration and barrel aged for 22 months. They were bottled on Feb, 20th 2007. James Halliday Wine Companion 2007 : 95 Points Click here to view. Stephen Tanzer International Wine Cellar Jul/Aug 2006: 91 Points Click here to view. The Shiraz 2004 was also reviewed in March 2006 in the Danish premier Food & Wine Magazine Smag & Behag and beautifully matched up to Osso-Buco! “A charcoal black bomb with very concentrated fruit and well integrated oak” Click here to download review (in Danish). The wine has an intense red, almost black colour. It shows very concentrated fruit and oak characters. The wine has many typical Shiraz elements on the nose such as liquorice, dried herbs and ripe dark fruit. The taste is dominated by the dark fruit and sweetness, which is kept in place by the firm tannins from the oak and a balanced acidity. The wine has a long, dry and peppery finish. The wine was bottled on Dec. 21. 2005. The colour is intense red, almost black. This is a very big full-bodied wine that hangs long on the glass. It has a complex nose of blackberries, smoke and liquorice. The taste is big and has a sweet fruity character with the oak well integrated. The tannins are already soft and the wine has a long dry finish. A cooler January and better spring rains delayed the onset of intense summer stress, allowing for excellent fruit nutrition while the high temperatures of February and March ensured great ripening with an acceleration at the end of March that almost caught us off-guard. Very promising! All 4 varieties were hand harvested, though of the Merlot there was only 140 kg. It was co-fermented with the Cabernet Franc. Cabernet Sauvignon was fermented on its own. Shiraz yields were just around 1 ton/ acre while the cabernets and Merlot cropped much lower. This year the wine was made on site in the winery finished a couple weeks before harvest. Open fermentation vats with hand plunging mark a significant departure from techniques used in previous vintages. Our reserve HD Shiraz was fermented in open new oak vats and while temperature control proved a challenge, initial results look good. After 10 to 15 days of fermentation, the wine was gently pressed using a manual basket press and put in 100% tight grain French oak. This is also another significant difference from previous vintages. Only 30% new oak was used to avoid overpowering the well-balanced fruit, except for the reserve HD Shiraz that was put in 100% new French oak. After a year in the bottle, the Shiraz 2003 has matured beautifully and it’s now better than ever. It has a deep red hue with a purple edge. It opens with sweet fruit and has some notes of light smoke, liquorice and vanilla from the oak. The flavours are complex and fruity (Cherries & Elderberries) with a hint of sweet vanilla. The wine is dry with fine tannins and a well-balanced finish of the oak and sweet red berries. With medium body and a long finish, this 2003 vintage will certainly continue to age beautifully. Released in October 2005. Only three month after bottling, the Shiraz 2003 is already accessible and ready to drink. It has a deep red hue with a purple edge. It opens with sweet fruit and has some notes of light smoke, liquorice and vanilla from the oak. The flavours are big and juicy, the wine is dry with a well balanced finish of the oak and sweet berries. With medium body and a long finish, this 2003 vintage will certainly continue to age beautifully. Release is planned in October 2005. Click here to download review. Though a bit wetter than 2002, 2003 would also qualify as a very dry year. The vines now being older cropped a bit heavier but still only Shiraz was made that year. A lower level of stress allowed for a more balanced fruit, which was further enhanced with a softer oak treatment. The wine was aged for 20 months in 40% new steam bent American oak, the remaining being 2 year old American oak. The wine was bottled on Feb. 6 2005. Now more than two years after bottling this wine is still in it’s youth but it is starting to show more developed characters as well. The sweet fruit and smoke from the oak barrels are still dominating the nose along with some liquorice and eucalypt. The 2002 Shiraz has evolved to a wine with more complexity, more depth and a fuller body. The finish is soft with some oak and the wine is starting to show more prune and chocolate notes. The wine has had a yearlong maturation in the bottle and is now starting to soften. It has a dark ruby colour and opens with spicy oak and sweet fruit on the nose. The oak characters are nicely integrated with the fruit still leaving a dominance of dark berry flavors. It has soft tannins with a good mouthfeel and it finishes with notes of plums and blackberries. The wine is still young and we definitely recommend decanting 2 – 3 hours before drinking. 2002 is the first year the vineyard produced enough grapes to warrant making wine. It was an extremely dry year throughout the season, with yields well below 1 ton per acre. Rich concentration and high skin to pulp ratio characterised the berries at picking. Only a Shiraz wine was made that year. 100% new steam bent American oak was used to work with the concentration of the fruit. The wine was matured in oak for 20 months and was bottled in January 2004.